On Friday, the students and staff of Alliance High School gathered with Alliance-area veterans for the school’s third annual Veterans Day assembly. The event began with an instrumental rendition of “God Bless America” by the school’s band, followed by the National Anthem with lyrics signed by students from Jennifer Armstead’s American Sign Language class. 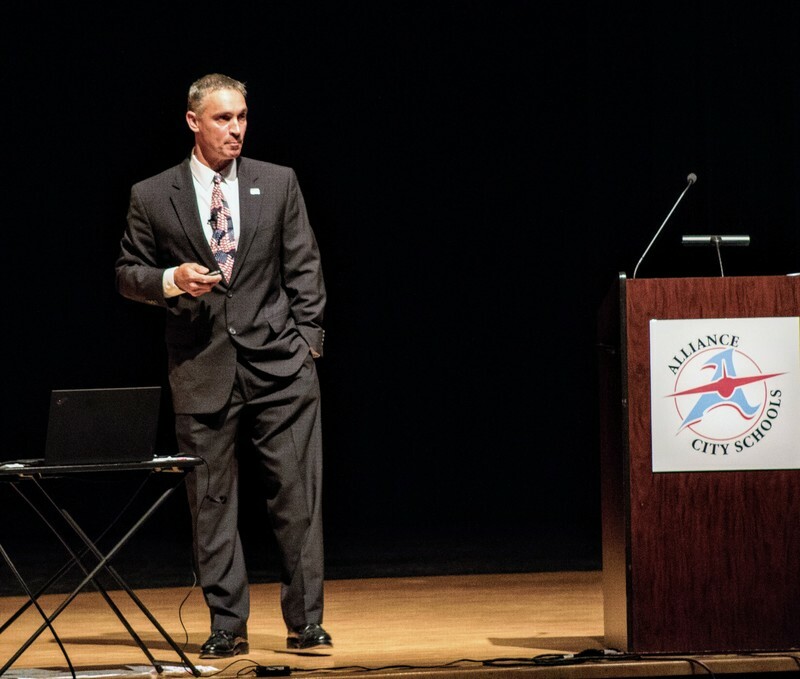 Following the opening music, Corey Streza, former Air Force lieutenant and 1987 graduate of AHS, launched into a presentation regarding his family’s long history of military service. Streza began with his grandfather, a veteran of World War I, and led the audience into a discussion about his father, who served during World War II. He recalled stories from his father’s Army days, which highlighted the severity and prevalence of PTSD in veterans. His father was haunted by images of German families who had hidden in their basements to escape the fire during the incendiary bombing of Dresden. Though their homes were not burned, the fire took away all the oxygen and the families suffocated. Once finished with his father, Streza spoke about his uncles, both of whom served as soldiers, one in the Navy and the other in the Korean War. His uncles’ sons also entered into the military. Streza moved on to his brother, Brett Streza, a 1981 AHS graduate, who served as an Air Force navigator during his time in the military, earning the Silver Wings award for his quick thinking after his plane’s navigation system failed. He used a sextant and the stars to get the plane back to the base. Returning to America after his service, Brett joined the FBI as a special agent. Later he was transferred to a terrorist task force in the wake of 9/11. Following his death from cancer in 2005, the Brett Streza Memorial Scholarship was established to help student athletes graduating from Alliance High. Finishing his presentation with a mention of Brett’s wife, who also served in the Air Force, Streza thanked the veterans in the audience whom he knew as a child, citing their influence in his life. Streza then handed the stage over to former Army Ranger Cmdr. Nate Self, who talked about veteran Marc Anderson in a video message. Anderson, a 1990 AHS graduate, was in same Ranger unit as Self, who spoke of Anderson as a great and remarkable person. Anderson and Self went on a mission to rescue a captured Navy SEAL in Afghanistan. Their helicopter was shot down, and a 15-hour firefight ensued. Self sat next to Anderson as he died atop a mountain, in deep snow. Self ended his video with a touching story about how Anderson, who taught junior high math before joining the military, left money in his will to one of his former students so she could go to college. Joe Beichler, who teaches Government and Sociology at the high school and coordinated the Veterans Day event, thanked Streza and the veterans who attended the assembly. He directed the crowd to junior Will Kinser, who closed the assembly with a moving performance of “Taps,” leaving the audience with a profound sense of pride for the veterans.